As many as one in three drivers across the UK regularly indulges in a habit that could prove extremely dangerous – eating at the wheel. This is the conclusion of new research from road safety charity Brake, which polled 1,000 UK motorists and determined as many as 33 per cent of respondents were regularly eating when driving. Overall, the statistics showed motorists between 25 and 34 years old were the worst offenders, with more than half (55 per cent) in this age bracket admitting to doing so. Additionally, around one-third of this age group said they do this at least once a week. Alice Bailey, communications and campaigns advisor for Brake, said: "Imagining a distracted driver you may think of someone on a mobile phone, but many things can dangerously draw our attention away from the roads around us. 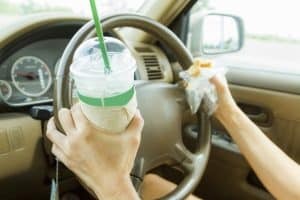 "In the fast-paced world we live in, it is sometimes tempting to eat on the go, but drivers who are distracted by something else, even food, significantly increase their risk of causing a devastating crash." Distraction is one of the most common causes of accidents on the UK's roads and motorists must therefore be vigilant to avoid any behaviour that unnecessarily takes their attention away from the road. While it is not against the law to eat and drive, it is a dangerous habit and one that could lead to serious consequences for drivers, their passengers and innocent members of the public in the event of an accident. Natalie Brinkley, brand manager at Fuel Card Services, added: "It's something that you don't really think about but eating at the wheel can be as, if not more, dangerous than using your phone whilst driving. If using your phone is illegal then why not eating?"